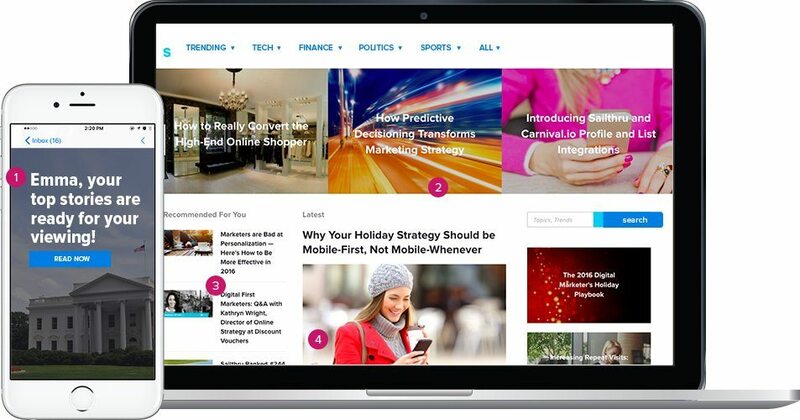 No other website personalization solution can provide such robust and intelligent personalization today — using a combination of interest data, wisdom of the crowd, and predictions, Sailthru provides contextual recommendations across channels throughout a customer’s entire lifecycle built on their past, present, and future behaviors. 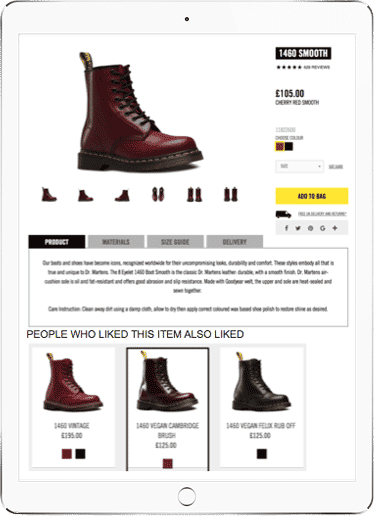 Serve up product and content recommendations based on a customer’s interests, preferences, and browsing patterns. For unknown visitors to your site, personalize based on the history of other customers who have read a piece of content and display other stories that the other customers or “crowd” most commonly read. React to your customer’s current and past behavior by offering discounts and offers to them onsite and in real-time based on their likelihood to convert. Sending a 20% off offer to someone that won’t buy anything below a 40% off or greater offer isn’t effective, personalize their offer using SPM by sending them a discount at their specific point of conversion, in this case, 40% off. 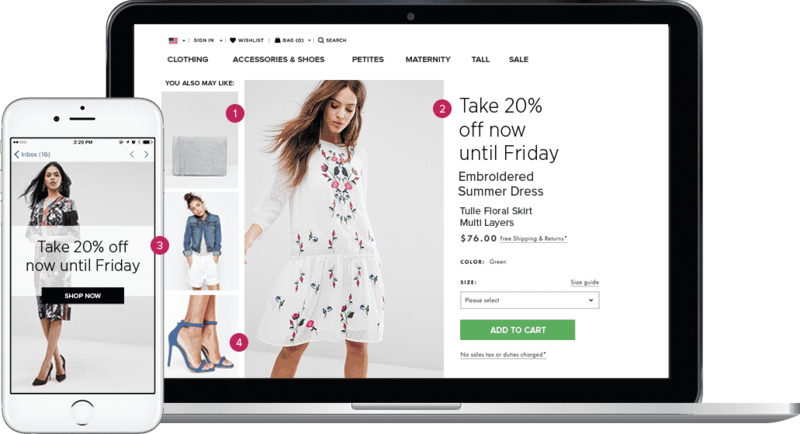 Deliver dynamic discounts and offers to your consumers across your homepage, product or store page, or even within a customer’s shopping cart. To provide an even more consistent customer experience, discounts across email can carry over to a customer’s web experience (and vice-versa) to maximize a customer’s opportunity to convert. Acquire new customers through a pop-up offer based on a customer’s engagement with your website or mobile app. 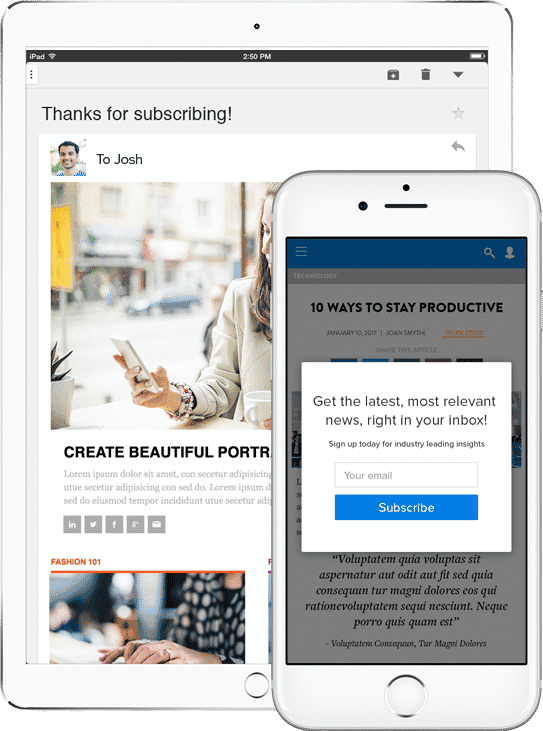 Avoid the hassle of integrating different solutions for email, web, and mobile for both real-time personalization and recommendations—leverage one, enterprise-strength solution for all. Set rules for recommended products and content using Sailthru’s scripting language, maintaining full control of the customer experience. Gain insights on how consumers are engaging with your brand, including when they are interacting, which products are triggering transactions, and which channels are most effective. 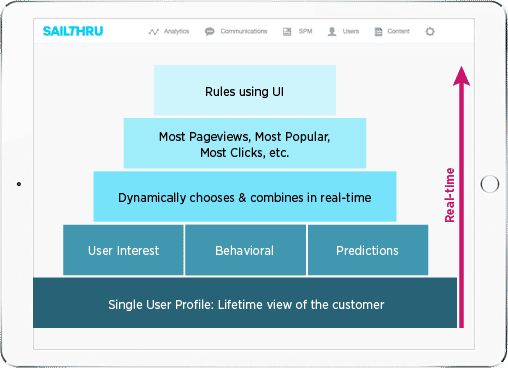 No other personalization solution can provide such robust and intelligent personalization today — using a combination of interest data and wisdom of the crowd, Sailthru provides contextual recommendations across channels throughout a customer’s entire lifecycle built on their past, present, and future behaviors. Identify customers who have ad blockers enabled and respond with appropriate message to re-engage them with your site or encourage them to subscribe. Deliver unique personalized content to your consumers across your website or subscriber homepage. To provide an even more consistent customer experience, content presented in an email will not carry over to a customer’s web experience (and vice-versa) to maximize a customer’s exposure to new and fresh relevant content. Acquire new customers through a pop up form that’s personalized by a customer’s session, identifying their preferences to create a signup form pop up that’s relevant and personalized to that specific customer. Set rules for recommended content using Sailthru’s powerful scripting language, in an easy to use interface – (no coding knowledge needed) – maintaining full control of the consumer experience. Mix personalized and editorial curated content to ensure relevance and amplify your brand. 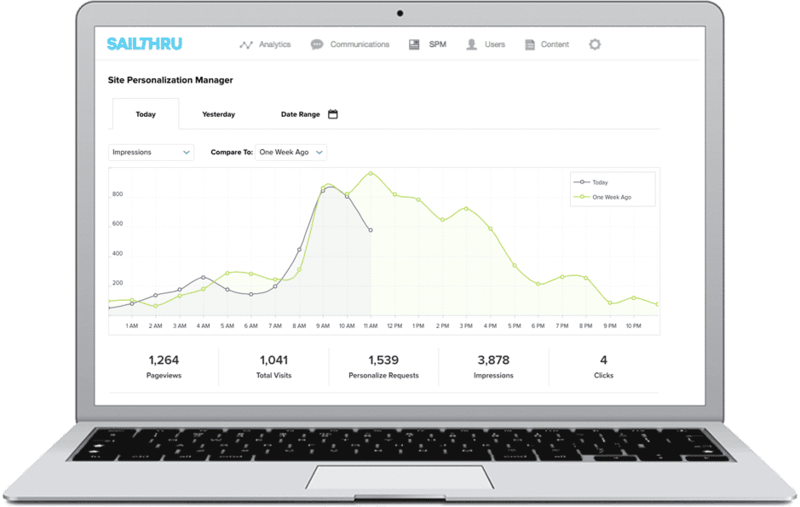 Gain insights on how customers are engaging with your brand, including when they are interacting, what content is triggering subscriptions, and which channels are most effective. Say “hello” to more effective website personalization.